Written on October 6, 2005, and categorized as Secret and Invisible. All around and about the patch of suburban south London where I grew up, there was evidence of the Victorian obsession with order, classification, heirarchy and status, and also of the tumult of the following century that tore all that certainty apart, and nowhere was this more evident than railings. A lot of the railings that once surrounded parks and municipal lawns were cut down during one or other of the two world wars, on the pretext that this was for munitions, tanks, aeroplanes, etc., but the vast majority of the metal reclaimed in this way, along with kitchen pots and pans, and Uncle Robert’s bathchair, was completely useless for that purpose. How effective a morale-boosting initiative that was: we now have only one pot to piss in, and the park’s borders are forever defined by a metal barrier which disappeared more than sixty years ago. 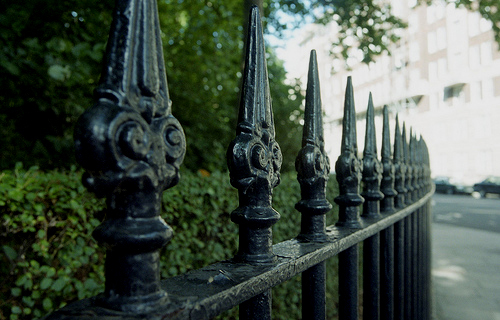 Some of the long lines of railings survived – posher houses, schools, hospitals got to keep their heavy wrought iron, and these were painted and repainted, fine details obliterated by layer upon layer of lead-based green or black gloss paint, or left unpainted to rust and grow thin, becoming ever more fragile and brittle. Certain stretches of railing could be broken by a good kick, but you had to be careful, or the great War God Tet Ah Nhus would come down from metal heaven and bite you in the leg and kill your face. There were particularly fine lengths of railings around my primary school, and one of the first things I learned to do was to walk at a steady pace with a stick held horizontally, listening intently as the notes made gongs out of each metal stem – bing-bong-bung-bing-bang-bing-bing-ding-thwock-bing-bing-beng-bong-bing-dong-bung-bing-bang-bing-bing-chug-thwock-bing-ding-beng-bong – wonderful entertainment for the musical ear aged five, and maddeningly distracting for attendant adult with a head full of Premium Bonds and an arse full of piles. Being forbidden made it more special, and soon I had logged all the places in the area that lines of railings lived, and visited them in order to make my processional, Balinese street music at leisure. Railings kept me in school, and once, aged ten, out of school, when I managed to impale my left hand whilst returning a lunchtime ball which had landed in front of me in the road. Climbing onto the wall, I threw it back, slipped, and for a few grisly seconds, the weight of my body hung from my punctured hand. I pulled myself up and off, jumped down onto the path, spread my fingers and stared at the enormous wound. As I did so, I realised I was looking at the other side of my skin – the wound had not quite gone right through – before it filled with blood. “Come in, love, and I’ll put a plaster on it,” said a helpful but entirely misguided dinner lady. I looked at her, and decided that this was a professional clean up and stitch job, so ignoring her well-meaning but ludicrous advice, lifting up my left hand with my right, I jogged gently back up the hill home, and when I got there calmly announced that I would need a visit to hospital. I was descended upon by Mum and siblings with lashings of prompt sympathy, whereupon to my great surprise, I cried. Damn! I had been so determined not to, but the bastards went for the emotional jugular. In hospital, I got three stitches, which I still have, in a small wooden box, much to the disgust of various girlfriends. This wound was blamed for my depression (nobody ever asked me, “Any recent bereavements?”) so a few months later, I was prescribed valium. Bing-bong-bung-bing-bang-bing-bing-ding-thwock-bing-bing-beng-bong-bing-dong-bung-bing-bang-bing-bing-chug-thwock-bing-ding-beng-bong went my head, but nobody was listening then. I found railings later – I filmed them in Wood Green, when I got to art school, just walking around Woodside park in the sun, with a stick making the notes. It was a piece I never showed, never finished. I do like the regimented, time-honoured look of London railings. However, I have to say that the despotic ornateness of those in Moscow are horrendously more impressive. Wrought iron? I thought that fence was made entirely of paint. That all I ever found digging and picking at it. victorian england would have been a fine place to live. if you weren’t gay. Those black spiked railings are overly aggressive. Especially around parks. The ones that piss me off the most are around those little private parks in city squares that are virtually the only green spaces you can sit and have a sandwich or chill out at lunchtime. But no they are for residents only, yet are completely empty every bloody lunchtime. Right, rant over. I’ve seen those railing and often thought about running a stick through them. You caught my curiosity that you made your post about them and you didn’t let me down. You worked up to it slowly, sort of introducing me me to the concept of railings having a place in cast of a person’s life until by the end they have become a main character, one that will be missed.